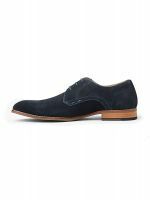 Every gentleman needs a pair of classic Suede Derby shoes in his wardrobe. The Navy Suede pair are crafted and hand-finished from nubuck leather with a comfortable inner soul and hand stitched piping for added detail. Team them with anything, from smart chinos to jeans or shorts.